Along with a new gluten-free lifestyle comes many new and different food options. I've noticed recently that my tastes have changed and things that I would never eat in the past, I now enjoy. For example, I have a new found love for black beans and actually bought a can to make at home! That's just insane, what's next, peas??? Or maybe, perhaps, bananas. I have hated bananas every day of my life. I don't care how nutritious they are. The taste and smell just makes my stomach tie up in knots. Well it used to anyway, I haven't actually gotten close to a banana in some time. Lately I've been thinking that hey, maybe I should give them another shot. Perhaps it's the cramps in my feet screaming "You need more potassium in your diet! Try a banana for crying out loud!" More each day I think I might be adventurous enough to try one. 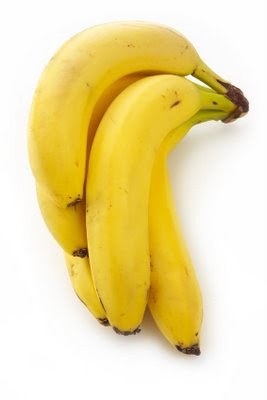 I was watching Good Eats the other day and Alton Brown was talking all about bananas and I just wanted one! They looks so delicious but I just don't know if I can handle the taste. I wouldn't even eat my mom's famous banana bread growing up. Oh now I'm dying to know if you ate one .... .they have to be perfectly ripe (just like the picture you posted). I used to work with a guy who was allergic, he could not even talk to me after I'd eaten a banana!